The awesome Emily Care Boss and I were interviewed by Sarah Richardson over at Women Write About Comics.com about the #DiversifyTabletop initiative. Here’s the interview in full! So, now we’re a community with the following as our mission statement; our purpose can be foundhere. Emily: Hi Sarah! Thanks for chatting with us. Our Many Games is a site (in progress!) meant to highlight and promote games by folks from groups often under-represented in game design: people of color, people with disabilities, queer folk, trans designers, and women of all ethnic backgrounds, for example. The site has links to the games and has been focusing so far on games that can be picked up and played easily from the text or that have quick-start rules and maybe a pre-written adventure—things to make it easy for interested GMs and players to get the game off the ground. OMG came about this spring when I put the word out on Google+ to see if people would support an initiative like that to get these folks games played more at conventions. For the past couple of years, there had been discussion of there being few games run or played at GenCon that were by more diverse creators. It seemed like a good idea to try to provide some tools for people who wanted to broaden their playbook. It’s been a slow process of development, but talking with Tanya helped give it more spotlight, so we’re looking at some further developments of the website this fall. We’re on track to re-launch the website in October, and we are talking with folks at Metatopia to help spotlight new games in development for designers who attend. So how did this Diversify Tabletop idea come about? What kind of response have you gotten? Tanya: Emily and I had been chatting about collaborating via email, and we finally rung each other up on Skype to noodle over ideas. We were talking about the #DiversifyStreaming2K15 list and thought about doing something similar for tabletop as a way for folks in the margins to find each other. The initial retweets and such have been great. There have been some other attempts to collect and promote lists of minority designers. What makes Diversify Tabletop different? Emily: There have been several other lists I’ve seen that each have a different group of designers in mind or that had a different focus. #DiversifyStreaming2K15 lists POC streamers. John H. Kim has alist of women game designers. RPGGeek has a list of women game designers. Wikipedia has a list of women role playing game professionals. There is one devoted to black (digital, I think) game developers that is short, sweet, and to the point. I heard about that from Tanya! 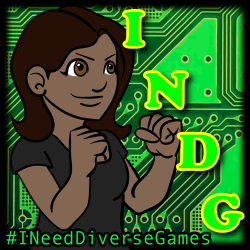 What’s different about #DiversifyTabletop is that it encompasses a larger group of people. And it’s connected with OMG, which we’re trying to make a resource for the designers as well as players and GMs. I’ll have to make a page on the site for all these sister lists, too! Why is it important to have diverse games be played? Tanya: Because seeing yourself in the games you play is important. Not just in having the option to be a different person in tabletop setting, but for the settings to move from High Fantasy and faux medieval England. What about people who aren’t sure if their game “qualifies,” i.e. not from a big publisher, doesn’t have high production values, is a microgame, etc.? Tanya: Any game qualifies. It doesn’t need to be from a big publishing house or something. The idea that a game needs to come out of a big name publisher or is perfect isn’t what we’re looking for here. Dream Askew by Avery Mcdaldno, Kagematsu by Danielle Lewon and Renee Knipe, and AMP: Year Oneby Eloy Lasanta. You can see the complete list here. What can people do to help Diversify Tabletop games? Emily: Educate yourself, and explore what’s out there. Watch Twitter. Read Google+. Pass what you learn along. Running a game is a great step. Maybe it’s for your friends or at your friendly local gaming store. Even if you haven’t done it before, give it a shot—many games are written for new GMs these days. Or be an enthusiastic player if a friend is looking to facilitate a game! Backing Kickstarters and buying games are great ways to support game creators, too! You can submit your own game using this form, or peruse the list there to find some new games. You can also find more at Our Many Games, and you should support I Need Diverse GMs on Patreon.